Do what it takes to protect your horizon from the ever encroaching enemy attack! Use the unique risk reward multiplier system to maximise power-ups, build your bomb and destroy EVERYTHING! 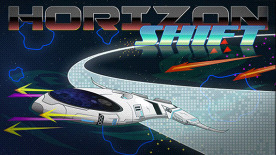 Horizon Shift also features an amazing pulse pounding soundtrack produced by Jason Heine of Heine House Entertainment.